Shows how to achieve EMC compliance early on in the design process. Provides the knowledge to trace system EMC performance problems. Follows best design practices. This book provides the knowledge and good design practice for the design or test engineer to take the necessary measures to improve EMC performance and therefore the chance of achieving compliance, early on in the design process. 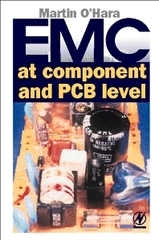 There are many advantages for both the component supplier and consumer, of looking at EMC at component and PCB level. For the suppliers, not only will their products have the competitive edge because they have known EMC performance, but they will be prepared should EMC compliance become mandatory in the future. For consumers it is a distinct advantage to know how a component will behave within a system with regard to EMC.